Over the full market cycle, each side presses its advantage as much as possible. Historically, the DRAM market has been the most volatile of the major IC product segments. 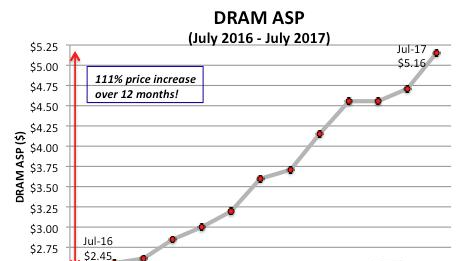 Figure 1 reinforces that statement by showing that the average selling price (ASP) for DRAM has more than doubled in just one year. In fact, the September Update to The McClean Report will discuss IC Insights’ forecast that the 2017 price per bit of DRAM will register a greater than 40% jump, its largest annual increase ever! Just one year ago, DRAM buyers took full advantage of the oversupply (excess capacity) portion of the cycle and negotiated the lowest price possible with the DRAM manufacturers, regardless of whether the DRAM suppliers lost money on the deal. Now, with tight capacity in the market, DRAM suppliers are getting their “payback” and charging whatever the market will bear, regardless of whether the price increases hurt the users’ electronic system sales or causes it to lose money. Previously, when DRAM capacity was tight and suppliers were enjoying record profits, one or more suppliers eventually would break rank and begin adding additional DRAM capacity to capture additional sales and marketshare. At that time, there were six, eight, or a dozen DRAM suppliers. If the supplier was equipping an existing fab shell, new capacity could be brought on-line relatively quickly (i.e., six months). A greenfield wafer fab—one constructed on a new site—took about two years to reach high-volume production. Will the same situation play out with only three DRAM suppliers left to serve the market? Recently, Micron stated that it does not intend to add DRAM wafer capacity in the foreseeable future. Instead, it will attempt to increase its DRAM output by reducing feature size that, in turn, reduces die size. Eventually, as the company moves down the learning curve, it will be able to ship an increasing number of good die per wafer. However, SK Hynix, in its 2Q17 financial analyst conference call, stated that it plans to begin adding DRAM wafer capacity since it is not able to meet increasing demand by technology advancements alone. Samsung has been less forthcoming in its plans for future DRAM production capacity. Although Samsung and Micron may tolerate SK Hynix’s DRAM expansion efforts for a short while, IC Insights believes that both companies will eventually step up and add DRAM wafer start capacity to protect their marketshare—and DRAM ASPs will begin to fall. As the old saying goes, it only takes two companies to engage in a price war—and there are still three major DRAM suppliers left.